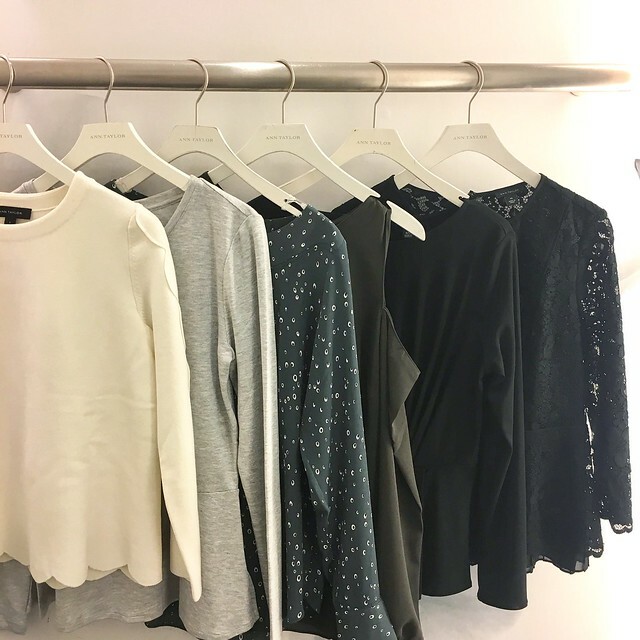 Get an extra 50% off sale styles at Ann Taylor. I’m obsessed with many of the new arrivals in their latest collection. It’s like a scallop lover’s dream come true. How cute is this scalloped shift dress which is perfect for Valentine’s Day and into the spring? I love this scallop trim top and size S fits me really well since it runs small and short making it petite friendly in the regular missy size. I would suggest going up one size for comfort unless you prefer a more fitted look. The material is a thicker weight making it look and feel more high quality. 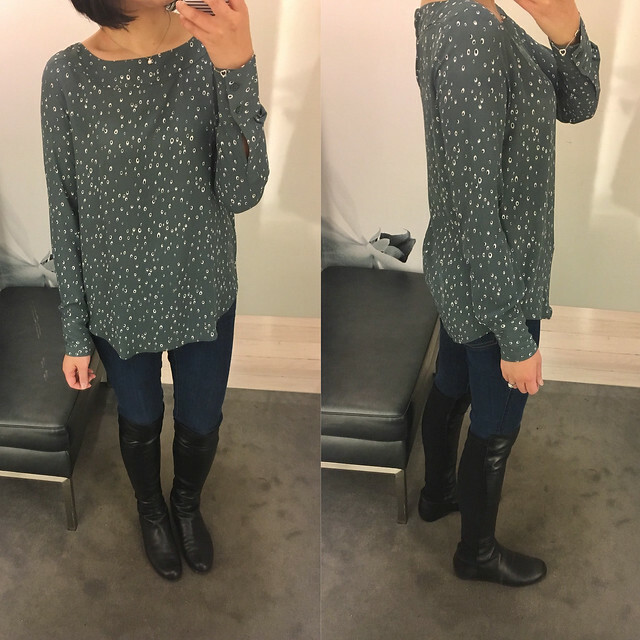 I love the pretty rain drop print on this top as well as the color. 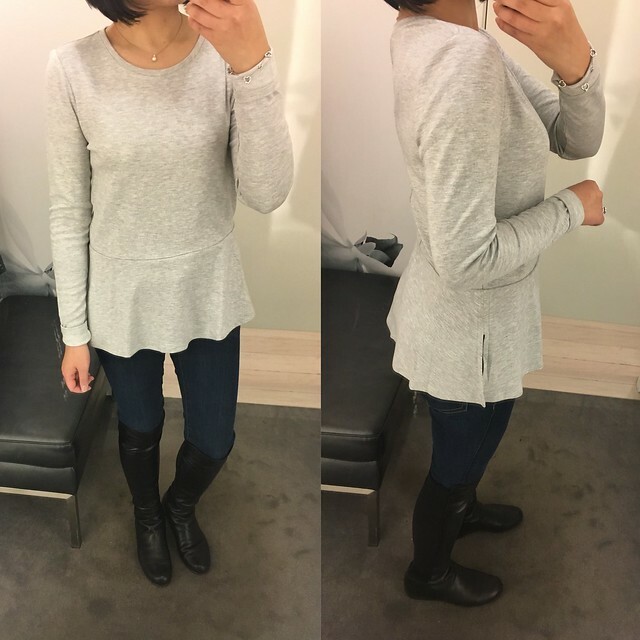 This top fits true to size to slightly smaller since I’m usually size XXS regular or XS petite. However, size XS regular fit me really well and I wish I bought it in store when I tried it on because my size is now sold out online. Hopefully I come across it in stores again or my size pops back in stock online. 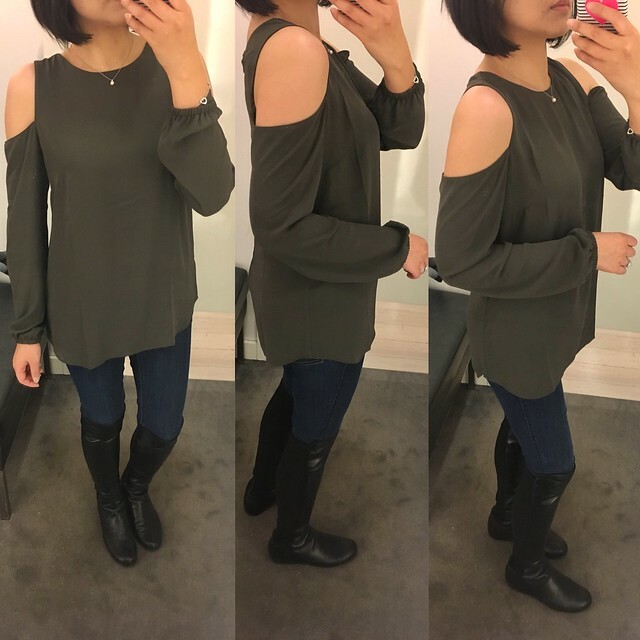 I also loved this new cold shoulder blouse which I was hoping to find in the dotted version which is practically sold out online. It’s also available in a beautiful winter geranium print. This blouse runs true to size to slightly smaller since size XS regular fit me pretty well even though I’m usually a size smaller (XXS regular or XS petite) at Ann Taylor. I love the thicker straps which allow you to wear it with your regular bra. 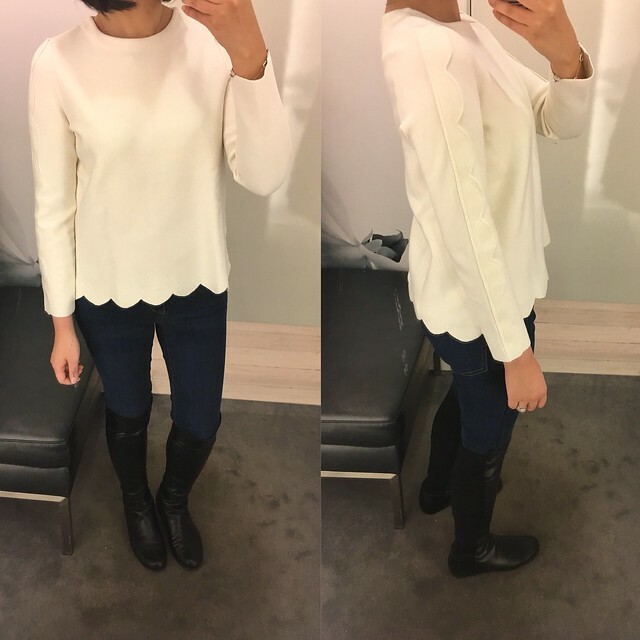 I liked this casual peplum top but the waist is still snug even though I sized up to size M regular. The top of the peplum flounce starts in the right place at the waist for petites so it may be too high if you’re taller or have a longer torso. I did find the sleeves to be a bit long in the regular missy size so I folded it up. I’d say this top runs smaller in the waist so I would suggest going up at least one to two sizes if you don’t have a flat/toned stomach area. 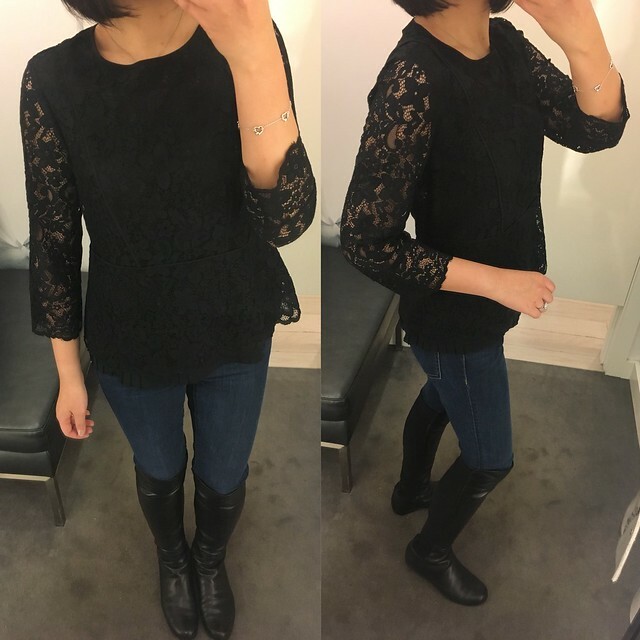 I wanted this lace peplum top when I saw it online but when I tried it on I found it to be really wide and boxy. Size XS regular fits more like S petite so I would suggest going down a size. 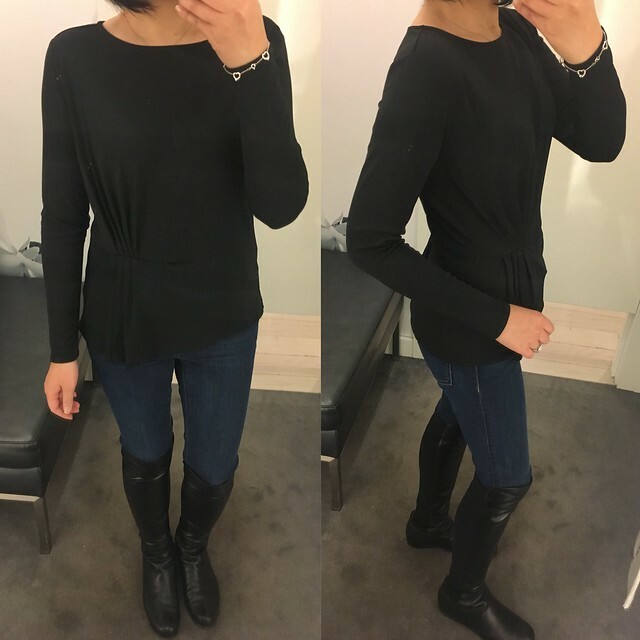 The regular missy size is a good length for petites so this top may be too short if you are taller or have a longer torso. Lastly, I tired on this side pleated top but the waist is a bit snug on me even when I sized up to S petite. Otherwise this top fits true to size everywhere else (sleeves, overall length, shoulders and bust). Size M petite would have been too roomy on me in the bust so I passed on this top.